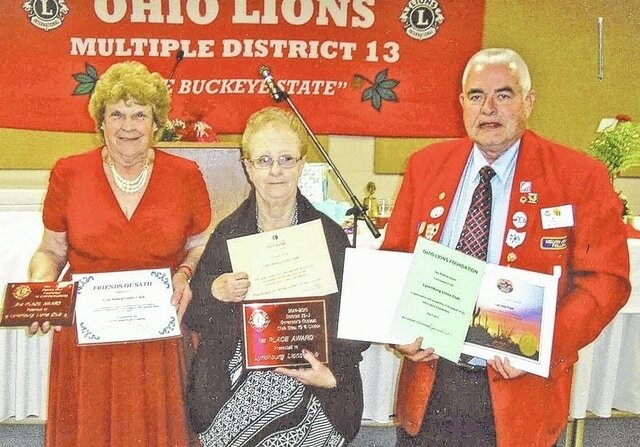 Pictured , from left, Lion Tamer Lion Janet Florence, Treasurer Lion Joyce Stroop, and Ohio Lions Foundation Trustee Jim Faust. All are active members of the Lynchburg Lions Club. They are pictured with the awards won by the Lynchburg Lions Club. The District 13-J Lions Convention was held recently in Washington C.H. The Lynchburg Lions Club received several special awards in recognition of its community service and Lions promotion projects. The club received the first place plaque for small division clubs in the governor’s competition. The Governor’s Award is presented in recognition of the total program of activities throughout the year. It recognizes a club’s involvement in local, district, and worldwide service projects, its fundraising events, and its support for the local community. The club received the third place plaque for communications and public relations activities and the third place rosette for the club’s scrapbook. The Lynchburg club was also presented four specialty awards for its support of the Ohio Lions Foundation, the district convention events, the Central Ohio Lions Eye bank, and SATH/Kamp Dovetail. Submitted by the Lynchburg Lions Club.